Listening to God can seem to be a baffling task, yet it’s actually pretty simple. I’ve never heard God speak audibly, but I surely have witnessed his voice through the Holy Spirit prompts while I read the Bible. I’ve heard him loud and clear through the voices of others as they spoke words into my life, whether in a sermon or everyday conversation. And I’ve heard God’s voice ring like a bell through circumstances only he himself could have orchestrated. But there is one factor that unites all of those opportunities to hear from the Lord. I have to make myself willing to listen. If I don’t practice hearing his voice speak to my heart in prayer conversation, how will I hear him against the noise of the world? Oh, there is so much to be studied about this topic. 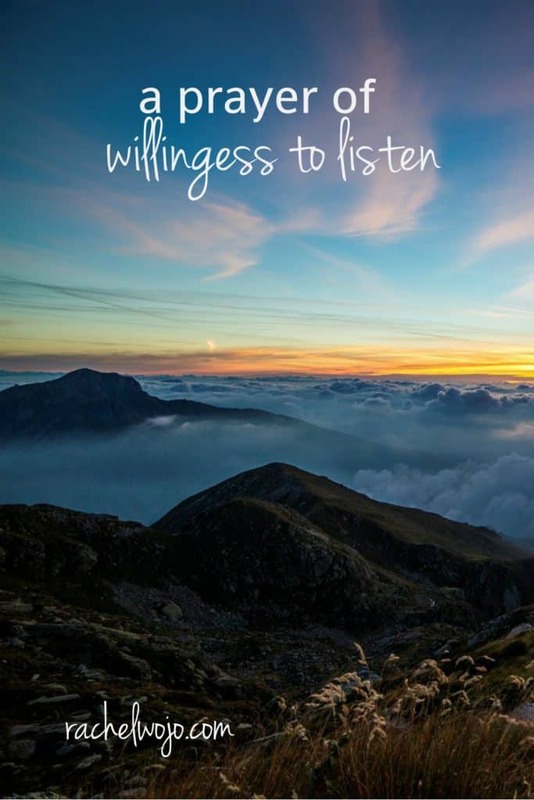 For now, I’m going to share with you a prayer of willingness to listen. May this prayer be the beginning of beautiful conversations with the Lord, in which the both of you enjoy to the fullest. So often I come to you with lists and demands. Like a tornado I spew them out as commands. Completely missing what you might have to say. And clouds my mind with fog and fears. I need you to clear my senses, O Lord! Give me a heart in tune with your Word. May listening continually be my choice. 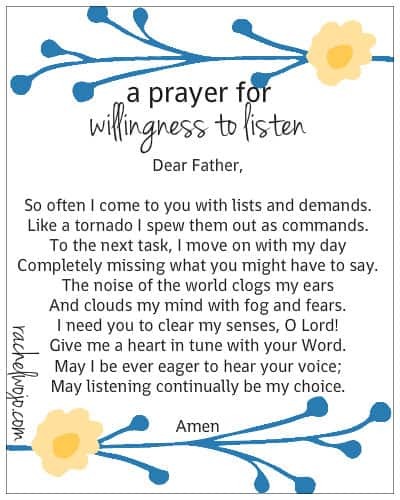 I pray you are encouraged to make this prayer your own. Enjoy a FREE Prayer Journal download! For years I have been writing that prayer is 10 percent talking to God and 90 percent listening to Him. If you are not listening how do expect to know your racers are answered? In my daily conversation with God I always get answers. Prayer is not a one way street. In my post Solitude I point out how important it is to seek a quiet place for your prayer time. If you find the time you might find some insight. This is a great post – take the time to listen for an answer. It is always there. Oh yes, the listening part…It can become difficult to remember that prayer is communication. If you are the only one talking in a conversation, then there’s a problem! Thanks for the reminder to listen, Rachel. Many blessings to you & your ministry. Once again, your message is so timely! My miracle daughter just graduated college and is moving on to the next phase of her life. Consequently, God has given me another reason why I need to get the book about my recovery done to encourage and inspire others! God bless you and thank you for everything you do Rachel!